According to the latest report released today from the National Association of REALTORS(R), existing home sales for August in the Midwest dropped 6.6 percent to a seasonally adjusted rate of 1.14 million units down from a level of 1.22 million units in July. The August home sales rate of 1.14 million happens to be exactly what it was this time last year for the Midwest which is not as well as the US is doing as a whole. As a whole, the rate of existing home sales in August was up 3.4 percent from a year ago with the West region being the biggest gainer, up 7.4 percent. Median home prices in the US fell 2 percent in August from July and, here in the Midwest, we saw median home prices fall almost double that, 3.8 percent, from $155,900 in July to $149,900 in August, which represents a decline in price of 10.5 percent from a year ago. Overall home prices in the US were down 12.5 percent from a year ago. 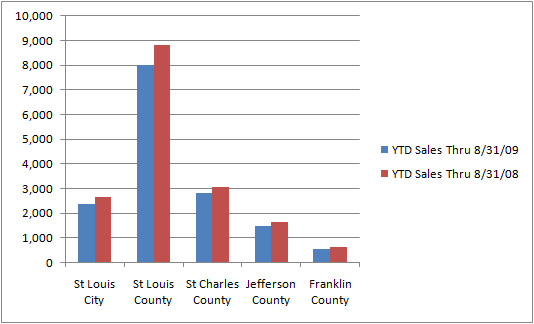 There have been 15,214 homes sold this year through August 31st in the St. Louis metro area compared with 16,810 homes at the same time last year for a decrease of 9 percent. The US as a whole had an increase in sales of 2 percent from last year (not seasonally adjusted). The median sale price of homes sold this year in St. Louis is $136,500, down 5.8 percent from this time last year when the median home price was $145,000. This is significantly better than the 12.5 percent price decrease in the past year for the US as a whole. The median time on market for homes sold this year in St. Louis is 63 days, just about the same as last year when it was 65 days. There are 19,635 homes listed for sale in the St. Louis area as of the end of August for a median supply of 11.2 months which is significantly higher than the 8.5 month supply for the US as a whole. Franklin County is definitely the area locally getting hit the hardest with a 19 month supply of homes for sale, a median time of 99 days on the market for homes sold this year. 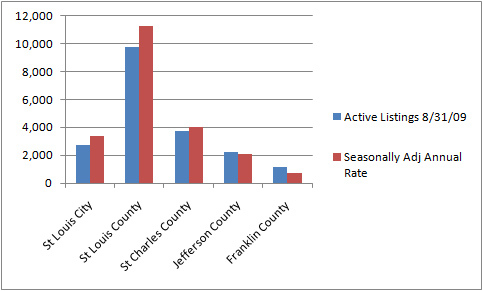 However, maybe the Franklin county sellers stubbornness is paying off as the median price of homes sold this year is only a scant 1.1 percent less than this time last year.